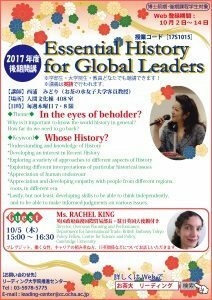 – Why is it important to know the world history in general? – How far do we need to go back? *Appreciation and developing empathy with people from different regions, roots, in different era. *Lastly, but not least, developing skills to be able to think independently, and to be able to make informed judgments on various issues. Captain in the United States Navy with 22 years of experience leading diverse professionals and managing standards, processes, and compliance. Transformed procedures and processes as part of cross-functional management of operations, maintenance, intelligence, safety, and training. Harvard-educated specialist in international operations with a proven ability to lead multi-cultural organizations. Long-term, international experience working embedded in local German and Japanese teams. None. Some papers might be distributed accordingly. (This is precisely the point I will be making. There is no “correct” version of history, at the same time, each and every interpretation has truth in every one of them thus “Text book” as such does not signify).